Like many, I’m always resolving to work more nutritious foods (and less junk foods) into my diet at this time of the year. 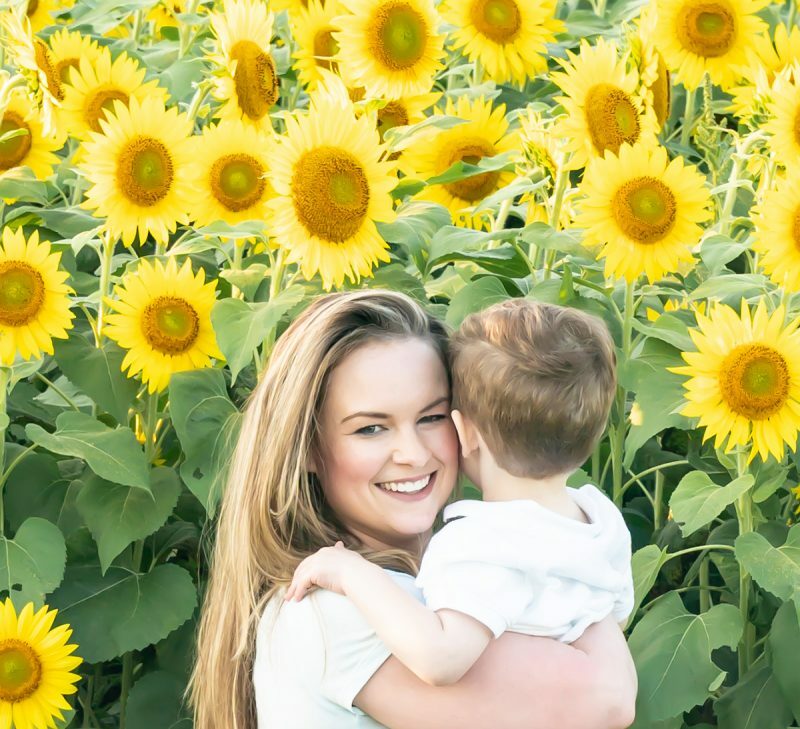 But then those days begin popping up when everything is frantic or nothing seems to go right and, by dinner, that whole resolution flies out the window. This amazing-tasting, easy, five-ingredient mashed squash recipe is for those days. 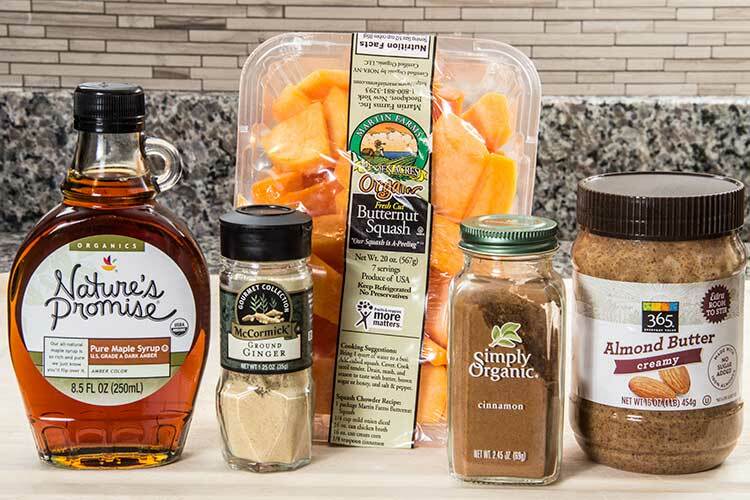 Aside from the butternut squash, all of the ingredients are staples I always have on hand. And the squash is cooked in the microwave, so it’s ready quickly (in about 15 minutes), with no pots or pans to wash later. Best part: this is definitely not a plain old side dish. It’s so good – with a hint of sweetness form pure maple syrup and plenty of richness from almond butter – that Meat-and-Potatoes-Guy and I always go back for seconds. 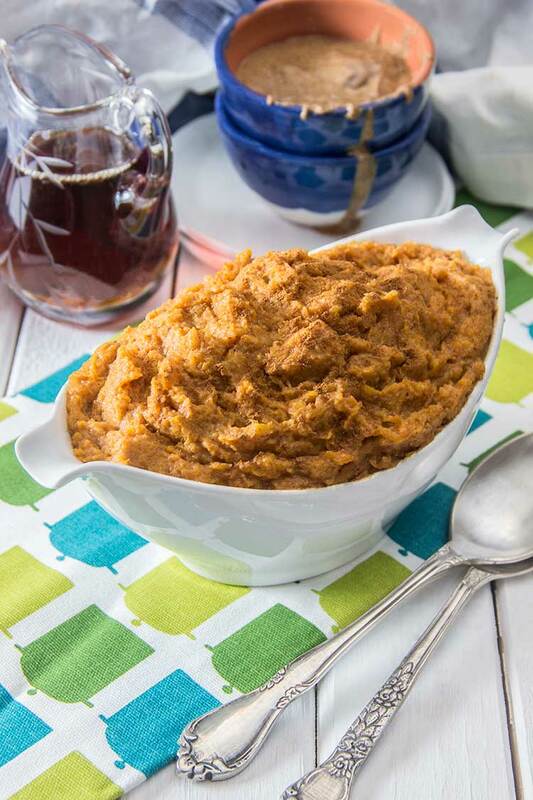 It’s a healthy veggie recipe that happens to taste like indulgent, rich, sweet comfort food! And if you want to feel like you’ve done something very healthy for yourself and your family, this recipe definitely has that covered too. 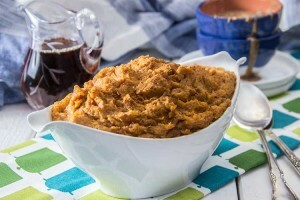 This recipe is vegan, so naturally it’s very low in saturated fat and has no cholesterol. And, per serving, this dish is packed with manganese, fiber (15% DV), potassium (17% DV), vitamin A (301% DV), vitamin C (50% DV), and even calcium (11% DV). 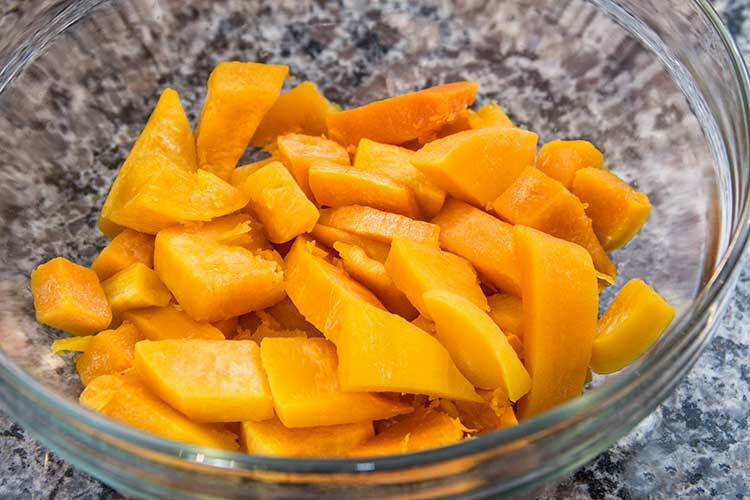 Add squash to a heat-safe mixing bowl and microwave uncovered for 6 minutes. Thoroughly stir. Place back in microwave and heat for 4 minutes longer and stir again. Place back in microwave and heat for about 1-3 minutes longer, or until squash is tender when pierced with a fork. 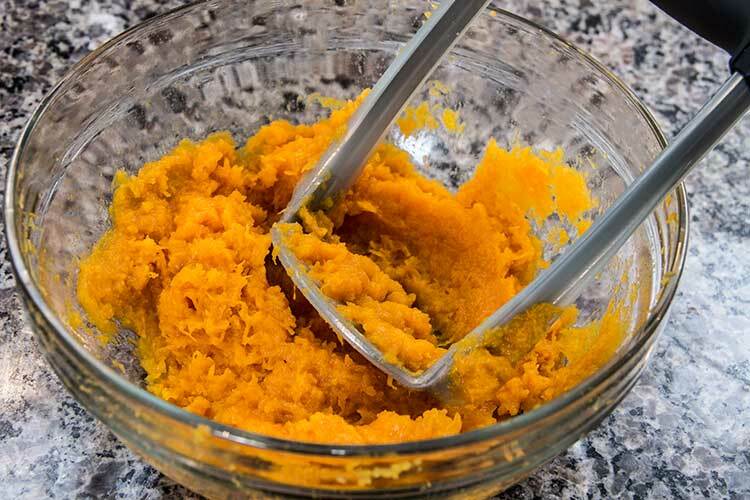 Using a potato masher, mash squash to a purée. Add almond butter, maple, cinnamon, and ginger. Season with salt and pepper, and stir until well combined. Serve. To keep things really quick and simple, I use packaged butternut squash that has already been peeled and diced. It’s really helpful to chop up any large pieces so that they’re all as evenly sized as possible. This ensures that some pieces aren’t still raw while others become overly cooked. Toss the squash into a large, heat-safe mixing bowl and microwave the squash uncovered for several minutes. Thoroughly stir it up (the stirring ensures that it all cooks evenly, so the pieces around the outer edge don’t begin to burn before the pieces in the center are fully cooked). Then toss it back into the microwave for a few minutes more. Stir again and microwave one last time, until the squash is tender when pierced with a fork. 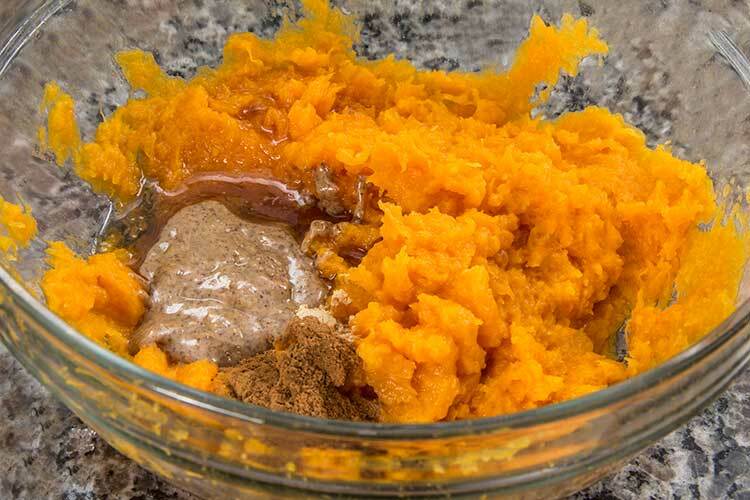 Then grab a potato masher and mash the squash to a purée. Next, it’s time to add lots of flavor. Begin by adding some all-natural almond butter. This is the key to adding a rich, creamy flavor to the squash. 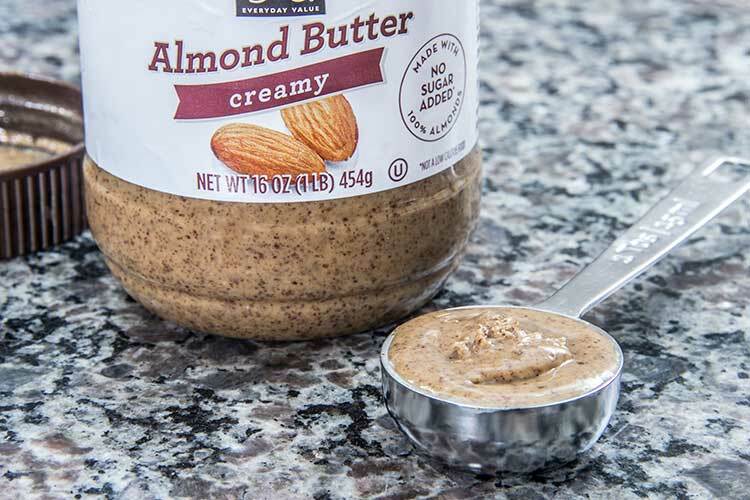 Although I prefer the flavor of almond butter in this recipe, 2 tablespoons of peanut butter may be used as a substitute. 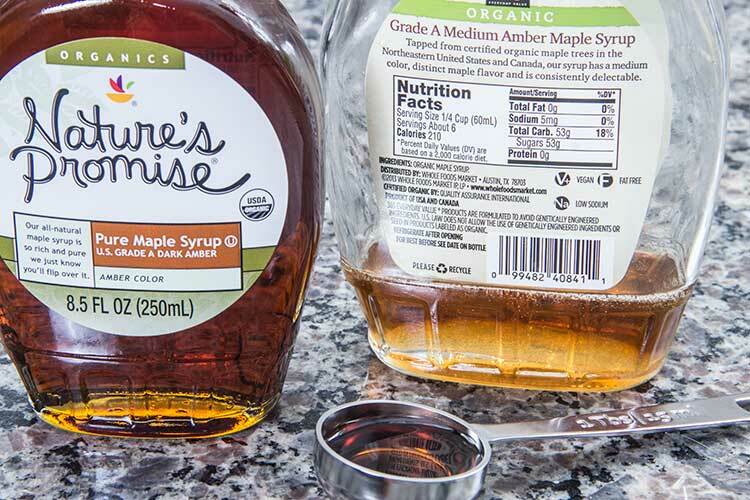 Also, to really bring out the sweetness in the squash, add some 100 percent pure maple syrup (“pure” maple syrup means that that is the one and only ingredient listed on the label). Then add some cinnamon and ginger for a bit of spice, and season with salt and pepper. Stir until it’s all well combined, and serve. It’s a really nutritious dish that’s ready for the table in about 15 minutes. And, with the richness from the almond butter and hint of sweet spice from the maple and cinnamon, it tastes addictingly delicious too. I tried this last week and it was so delicious! It was easy and so quick to make. I picked this recipe as one of My Friday Favorites today. You can check it out here. Excellent recipe! Going to try it but…. “Dice” means to cut food into even, small squares about 1/4″ in diameter and those squash in a package were no dice. I’m glad I saw the squash you were talking about because I’m using fresh whole Butternut Squash and would have spent all that time dicing the thing. Looks like the squash shown was a smaller one and was cut in half lengthwise and then cut 1/4′ slices. I don’t have access to the prechopped squash.